A Tutorial Showing How to Save Time, Paper, and Ink When Using Digital Papers! I know you are used to seeing coloring tutorials from me but I thought I would switch it up a bit and show you something new! I have just recently started creating digital paper sets and wanted to share some tips on conserving time, paper and ink when using them. For today's tutorial, I will be using my Tangy Trio Leaves digital papers. It is just $3.50 for either 12x12 or 8.5x11 formats. I am using the 8.5x11 format because it scales perfectly to fit A2 (4 1/4" x5 1/2") cards. I actually created this stack to coordinate with all of the new Tangy Trio products that Clear Dollar Stamps is now carrying. You can find cardstock, Copics, Tombow markers, and ribbon to match! Of course you could use my paper tips with any image, stamped or digi but I will be using my "Praying Mantis Eyes" digi for this dimension. It is available for just $3.50. First I opened up my MS Word program. You can use what ever program you use for digis and do the same thing. Instead of printing whole sheets of the different papers I "pre-layered" them with the program. Since my card bases are 4 1/4" x 5 1/2", I scaled my leaf base paper down to 4" x 5 1/4". I then layered some other papers on top of them leaving a boarder of the leaf paper showing around the edges. I did 3 sets like this so I can have room for 3 images and sentiments to create 3 card fronts from 1 sheet of white cardstock. Size your images and sentiments to the correct size for the look you want. (You may need to "bring image to front" and click "posistion" then "in front of text" to be able to move your papers and images around where you want them in Word). While you are at it, go ahead and cut a standard piece of cardstock in half and score to form you card base. I adhered my image and sentiment to a piece of scrap colored cardstock then trimmed them leaving a small border. I used double sided foam tape on the image and sentiment to give the card some dimension. Before placing them on my card front, I ran a piece of pretty ribbon across the card front and attached to the back. Here is a True :D tip: Totally compleate your card front on layered cards before you attach to the card base, so you can hide ribbon ends, brads or other elements you don't want visable on the inside of your cards. Then attach the sentiment, image, and a bow or what ever other embelishments you would like. Attach the card front to the card base and you are done! You still have 2 other cards you can create with the same sheet of card stck too! I added some green half pearls to my card too. Here are a couple of other digtal paper stacks that I created this month. Again, both are available for instant download in either 12":x12" or 8 1/2"x11" formats. They can be found in MY DIGITAL SECTION of Clear Dollar Stamps. Thanks so much for dropping by again today! I would love to hear what you think about my papers, tutorial, and/or card. All comments or questions are welcome! Spring Whispers Clearly Coordinating Collection is here! Today is the big shopping therapy day! Time to collect some of the items you have been drooling over the last three days! The first row is the ribbons, the second is the Tombow markers, and the third is our Clearly Coordinating cardstock! As you can see, we are still looking for a solid Peach Taffy ribbon, but we are certain we will find one soon! In the mean time, we have found a Peach Taffy and Lemon Zest combo ribbon....so pretty! Take a look at some samples with our new cardstocks and ribbons! What happens when you can't find paper in the colors or pattern you want? You make your own! Step one: Draw lines on your watercolor paper with your Cotton Candy Tombow with ruler. I started with a line from corner to corner and worked out from the center drawing my lines 1 inch a part. Step 2: Take your water brush or paint brush and watercolor your line. I didn't want anything precise, I just wanted a sketchy line. Step 3: Color circles of Pineapple Twist Tombow marker in the center of your squares. Step 4: Take your water brush and watercolor your circles to look sketchy as shown. NOW WASN'T THAT EASY-SHMEEZY (as my youngest daughter always says)? 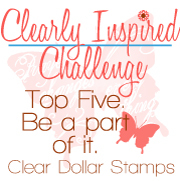 To see all of the items that are in the Clearly Coordinating collection go here! This background I created by printing of my circle background paper (see below) and coloring the circles in to match. I've created this background paper for you to print for yourself and color in! It is set up to print on a 8 1/2 x 11 sheet of cardstock and all you have to do is color it to match your project! This background I created by embossing the stamp pattern on watercolor paper. The stamp is Tender Heart Swirls. I then colored in the areas with my tombow markers and watercolored. I wasn't careful so as to create the variation and water lines on the background of lavendar (budding lilac). This took about 10 minutes...not very long! Day 0 of April Sneak Peeks! This is so exciting, we just had to give this news its own day for sneak peeks! of cardstocks, ribbons, tombow markers, and more to come! What is the most difficult part of buying off the internet? The big question: will it match when it gets here? Well, we have taken that guess work out of it for you. We have done all the coordinating and matching, so all you have to do is order and enjoy! Our first line that we are introducing is Summer Fun! The colors in this line are Lime Juice, Sweet Pea, Still Waters, Turquoise Gem, Bubble Gum, Tickled Pink, Cherry Go Round, Tangelo Smoothie, Grape Jelly, and Bee Pollen (yellow orange, but you can't see the word)! Don't those just sound yummy? Our cardstocks are solid color core, color all the way through, and are lightweight (67-75 lb). We chose lightweight because we love to layer! You can layer your cards lavishly and still sew through them and afford to mail them! All of our Summer Fun line are smooth on both sides. In our upcoming lines, we have mixed texture and smooth to give you some variety! We have a coordinating Tombow marker and ribbon for each color! Remember with Tombow markers you can color with them or watercolor with them! We have a Tombow marker tutorial right here for you! This card I used my copic markers on! We will have these sample cards BELOW of the matching ribbons (RIGHT) and cardstocks (LEFT) for you to purchase for $2.00 for both! This should really help you keep everything organized and decide what colors you want to collect! NOTE: The grape jelly ribbon is actually a nice coordinating match to the CS, as seen in the pretty dress card above, but the scan below on the sample cards shows a little darker. Here is a chart of the Tombow marker, Copic Marker, and Embroidery Floss that matches our cardstock! How easy is that! What colors are coming next month.......shhhhhhh......Spring Whispers....can you guess what colors those will be? PLEASE VISIT KATIE RENZ BLOG, AS SHE HAS ALSO MADE SOME PROJECTS WITH THE NEW CARDSTOCK AND RIBBON COLORS. See you tomorrow for day one of Sneak Peeks!